The focus would be the historical capital of Mahon. Originally a fortress on the largest natural harbour in the Mediterranean, it has grown up as a series of rings, each developed sequentially. The inner core of the city consists of very narrow streets, which offer good shade in summertime, but have traffic issues. Most streets have been made one way, with very narrow pavements. Car parking is very limited. The middle area of the city, where our neighbourhood resides is surrounded by a ring-strasse that separates the city from its hinterland. The ring road is semi-motorway, with no pedestrian or cycle ways and as such severs the city from the countryside. Since this has been developed more new neighbourhoods and industrial and commercial areas have grown up all around the city in ad-hoc way, further isolating the city from its countryside. Car usage is high, but it is not easy to park in the inner ring. People are used to leaving their cars some distance from their house and walking. Many cars are used for very short journeys, as there is little public transport within the city. It mostly services the surrounding villages. The project neighbourhood chosen was of quite high density, consisting of a series of parallel streets of apartment blocks typically 5-6 storeys high, developed in the 1990s. The street space between the blocks has become mainly a car park and there is no people space outside the blocks. This has meant a loss of community, as in the past it was the practice for Menorcans to sit in the street in the evening and talk. Children too are disenfranchised, having nowhere safe to play, and no easy route to school or green space. There is little in the way of recycling in the neighbourhood. To counter all these urban challenges the Roadshow developed a new strategy plan for the city, which reconnected it to its hinterland, yet still allowed development. This created e-connection with greenspace; Electric bike infrastructure – de-carred space; a more people-centred approach to the city. The neighbourhood was re-envisaged as a place for people, where people could share space once owned by the car, the area now offering shade and production in terms of food and energy. The neighbourhood promotes sustainable behaviour and contributes with energy storage, through a reimagining of the public space. Of the many varying scales interventions the most significant proposition would be the “Espina Energeticá”, a productive energy and water-gathering canopy shading 30 km’s of main road of the Island. PV farms are already present on the island, however with plans for expansion are under scrutiny due to opposition from various conservation and ecologist groups, this proposal not only negates the need to building on greenfield sites (built on the existing infrastructure) offers renewable energy and alternative mode of renewably powered transportation (Trolebús). 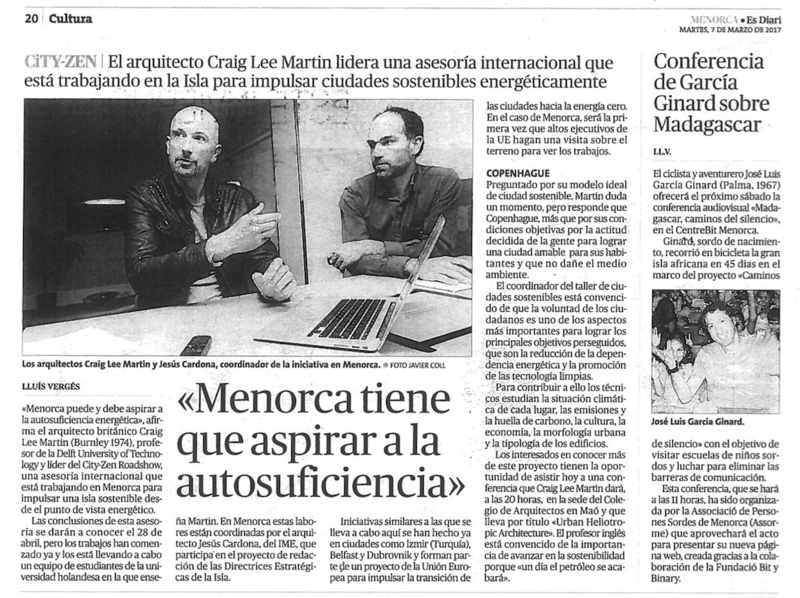 Based on an extensive carbon accounting analysis for the entire island an exciting finding was that if all Roadshow measures would be realised that Menorca could potentially be the first carbon neutral island in the Mediterranean.